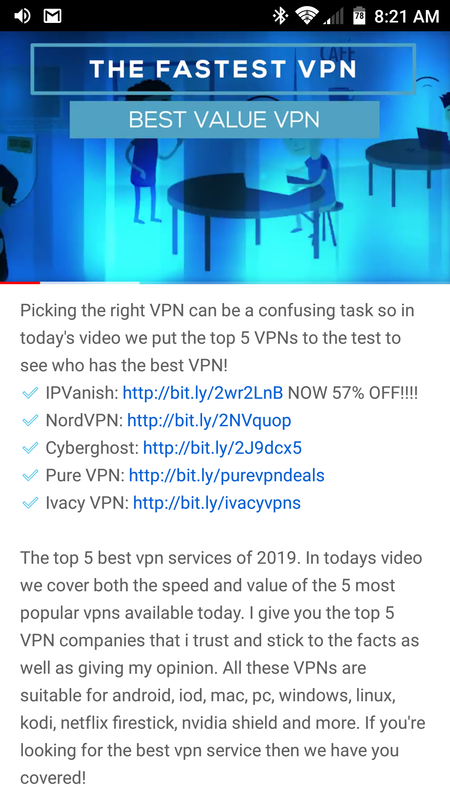 BEST VPN FOR 2019!! Top 5 VPNs Speed Tested!! | Promo2day BEST VPN FOR 2019!! Top 5 VPNs Speed Tested!! Do you use any of these,Mike? NordVPN is the best IMO. Never had any issues with it. I have dealt with the support and representative people of most of the vpn for the last 2 to 3 years regularly (almost every day), so I'll share my experience. purevpn is much more scam vpn company than tigervpn. their support people are fake. their representatives promise but don't deliver, and then ignore you, and they keep logs as you all know that they helped fbi.. fake is the word that comes to my mind when I think of this vpn and their people. Ivacy is great. I have a lifetime + their main person told me and considers me as one of ivacy's brand ambassador...support should be a bit more faster to reply. cyberghost support is great when they are available but not as great representatives and hard to get in contact with. (02-09-2019 , 03:30 PM)clyde Wrote: Do you use any of these,Mike? I currently have Expressvpn and Cyberghost on my laptop but very rarely use a vpn. Current time: 04-21-2019 , 05:58 AM Powered By MyBB, © 2002-2019 MyBB Group.